120mm metal fan filters prevent cooling cabinet fans from breaking due to dust and dirt buildup. This aluminum, stainless steel filter measures 120mm in length and 4.5mm thick. 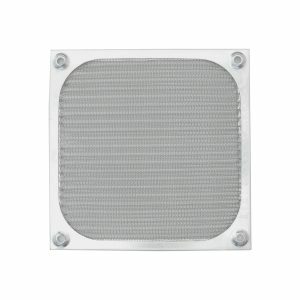 Metal mesh filters have more efficient airflow than polyurethane foam filters. These metal fan filters are also easier to remove and clean than the foam filter. GardTec stainless steel 120mm fan filters serve as effective EMI/RFI shielding to keep your electronics running without interference. This mesh filter can be bought in bulk for discounted value. GardTec has a large selection of reliable cabinet cooling fan kits and accessories at excellent prices.